Ruby is a Kitchen Facilitator App that runs on an iPad. It is a more accessible alternative to a conventional kitchen printer as every order coming in is shown in a visual format that can be easily and instantly processed by the kitchen staff and chefs. It is also meant to work in tandem with our Sapphire eMenu solution to provide an end-to-end solution for diner’s ordering up to the processing by the kitchen staff. Your kitchen staffs will enjoy its ease of use and operational efficiency. Ruby is the world’s first true kitchen facilitator using the latest in iOS and tablet technology. Orders can now be shown on the iPad screen instead of printing. Different orders can be directed to different stations, i.e. hot kitchens, cold kitchens, bar counters etc. 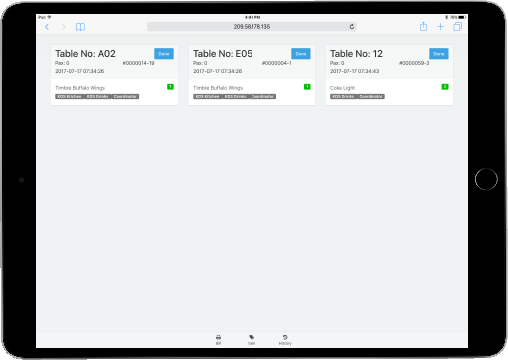 Orders from Sapphire eMenu will automatically sync and queue up on Ruby for your chef and kitchen staff to process quickly. You can easily switch between table orders or by food orders. Once a table and food order is ready to be served, just tap on the specific item and the server will be notified instantly via the system in real time. The days of annoying bells are long gone!